Should I Fix It Or Buy A New One? With the advent of cheap home electronics, people want to know what to do when their equipment breaks. To fix or not to fix, that is the question? Their dilemma is only compounded by the large number of cheap replacements at the discount chain stores. Why are manufacturers urging you to just throw away that old TV, not recycle it but dump it in the nearest landfill? Just throw it away, even though it is full of toxic material, including lead and other harmful stuff? There is now an added mandatory toxic fee charged on new TVs and monitors. You are paying extra for your new television to cover the costs involved in disposing of it, yet the manufacturer urges you to throw it away and buy a new one. The quality of new products has been dropping for over a decade. Most products today only last 2 years or less before needing repair compared to ten years or longer for products made a decade ago. Our customers often mention the TV in the bedroom or basement that is 12 or 15 years old and still playing. In the 1990s quality went out the window. Welcome to the New World economy, driven by “the bottom line” to deliver you a poor quality item engineered to last a short time past the expiration of the warranty! All new televisions for sale today suffer from 2 major faults. First, manufacturers are now making their circuit boards by putting parts on both sides of the board so that they will have a compact board that fits into a smaller space, produced at a cheaper price. Because of this, they can no longer dip the circuit board in solder as they used to do or they will destroy the parts they put on the bottom. Instead, they sprinkle the board with a poor quality solder dust and melt it with a type of blow dryer device. The connections come un-soldered in just 1 or 2 years instead of lasting 10 or more years like they used to do. This is part of the mechanism that allows them to bring you that cheap TV, although this same poor way of soldering is done on the more expensive models too, so that they don’t last too much longer than the cheap ones. This problem is readily repairable by soldering the broken connections by hand with the proper solder. When done properly by an experienced technician, your product can easily last many times longer than when it first left the factory. Another solder caused failure in modern sets is due to use of lead free solder. Lead free solder grows ‘whiskers’ that cause short circuits in todays tightly packed integrated circuits. For a complete read on the problems and costs involved with using lead free solder, see this article. By mixing a small amount of lead into the solder when it is manufactured, this problem is avoided. All electronics manufactured today are RoHS compliant, meaning that they use lead free solder and components resulting in early failure of the product. Second, manufacturers often put in a few undersized or low quality key parts, calculated to last until the end of your warranty. If one of them fails while still under warranty, your circuit board is replaced with another containing the same low quality parts. Once Hayes Electronics replaces these flawed parts with a quality part, your machine can last longer the second time around, sometimes by many years. In many cases, you could say we actually remanufacture the circuit boards in your television. Don’t give up on your equipment so quickly. Have it checked by a competent repair person first. When we repair your television it is actually quite likely to outlast that cheap replacement at the chain store! Save yourself some money, too. Repair is often the best option because our attention to the details can make it better, lasting longer, saving you money and energy in the long run. 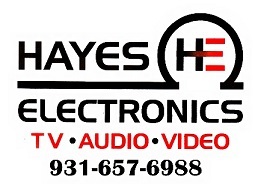 Hayes Electronics maintains a vast database of known problems covering all manufacturers. When we repair your television all parts known to have a failure history are replaced, not just the single part that may have been the cause of your immediate problem!